TimeSync gets the current time from a NIST server and adjusts the PC clock if necessary. It will try alternative servers in case the time cannot be obtained from the first server. You can use the "/auto" parameter to run TimeSync so that it will automatically synchronize the time without user action. How to extract: Download the ZIP package and extract to a folder of your choice. Launch timesync.exe. Added: INI file [response] FailedAuto= (server names). Emsisoft Anti-malware scan found DealHelper.com malware... which is strange because I've been using it for years. Anyone? As a couple of others have stated, this utility is completely unnecessary for Windows XP, Vista and Win7 because they already have time synchronizers built in. Other than for a school assignment for 'Intro to Programming 101,' I have no idea why someone would waste their time writing it. T-Clock enhances the clock on the Windows taskbar. 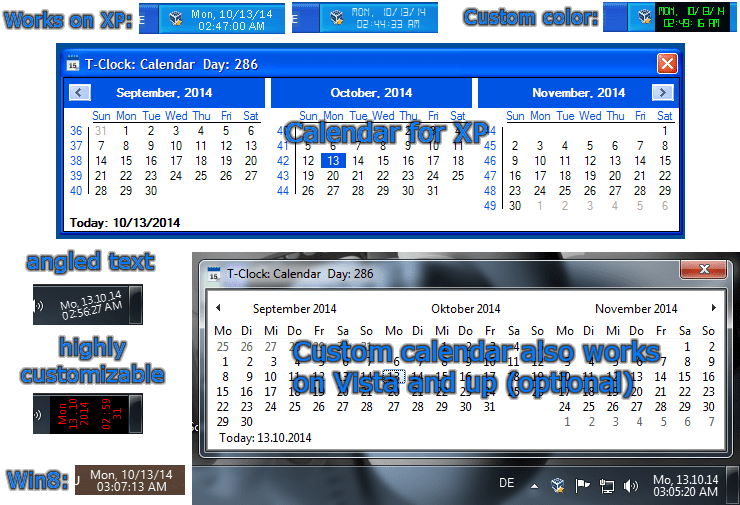 You can customize the display, define actions to perform on mouse clicks/drops, set multiple alarms, show calendar, manage windows etc. T-Clock Redux is an enhanced fork of Stoic Joker's T-Clock 2010 which is a successor of TClock, originally written by Kazubon in the early 90's. The 161 files included in the "tclocklight-040702-3.zip" package are mostly source modules kindly provided by the developer for the benefit of DIY hackers. NETTIME communicates with time servers over the Internet, used in many countries for accurate date/time information, kept correct according to observatory/GPS data. The program tries to connect to each of these servers until it finds the date/time information and then asks you to correct your clock (automatic correction available). NETTIME contains more than 100 predefined time servers and servers may be added or modified by editing the INI-file. An up-to-date server list is available. How to extract: Download the ZIP package and extract to a folder of your choice. Launch NETTIME.exe. I like Nettime because it installed as a service which updates the system time when you boot up your computer. Wonderful. Does anybody know an alternative which works from commandline (automatic and hidden, in background)? Neutron is small time synchronizing program that retrieves the accurate time from one of several specialized time servers on the Internet using the standard Time protocol (TCP or UDP port 37). Once the network time has been retrieved the program can synchronize your computer's clock to match it. How to extract: Download the ZIP package and extract to a folder of your choice. Launch Neutron.exe. Great program. Place shortcut in startup folder. Check the box "exit after time has been synced". Its quick and fast no extra time on boot up. Great program and very useful. The comment left by "just_someone" to check the time and exit works beautifully. Saves me a lot of trouble with multiple machines I work on that are off by a few minutes or hours.